Google Now finally made it into iOS and it is impressive to say the least. If you haven’t yet tried out Google Now for yourself you need to stop what you are doing and take a second to download it from the App Store. To get Google Now on iOS simply go into the App Store, search for the Google Search app, install it and begin experiencing Google Now. It definitely gives Siri a run for “her” money! If you have played around with Google Now through Google’s Search app you will realize in order to access it you need to first swipe down into the card interface. Why not have Google Now be the first thing that appears when you launch the Google Search app? 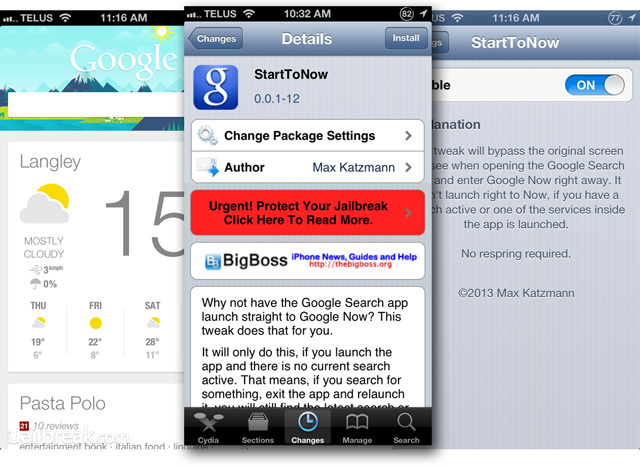 Introducing StartToNow — a Cydia tweak that will make it so Google Now is the first thing you see when you launch the Google Search app. StartToNow will only do this, if you launch the app and there is no current search active. This means, if you search for something, exit the app and relaunch it, you will still find the latest search or service you were using. StartToNow does have a settings panel that contains a killswitch, but that is it. If you would like Google Now to be the first thing that appears when launching the Google Search app then download StartToNow from the BigBoss repo for free. Let us know what you think of the tweak in the comments section below.